My husband and I celebrated our 13th wedding anniversary back in October, and I remember making hot chicken salad years ago as a newlywed in our apartment. The November 1962 issue featured the same recipe using turkey, so I knew I needed to make it again. Admittedly it isn’t much to look at. The picture in the magazine looks very boring and in person it isn’t much better. Over the years I’ve also added chopped apples, or changed the spices just a little. 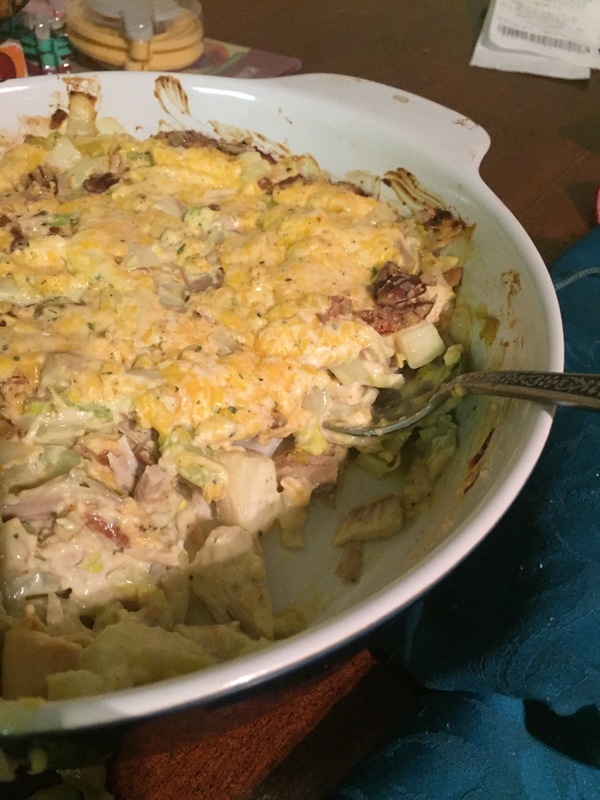 Basically you make a simple chicken/turkey salad; mayo, onion, celery, mustard, shredded meat, a dash of lemon juice, and salt and pepper; then you top it with cheese, top that with crumbled up chips (or sometimes I use nuts) and bake it until it’s hot and bubbly. So any variation you would do of a classic chicken salad will usually also work with this. One thing I love is that you can eat it various ways. My husband made a sandwich, my son just ate a spoonful on his plate, and I made a double decker open faced sandwich. It would also be good as an appetizer or side with chips or crackers as a dip, just dice the piece smaller. It helped get us over the leftover turkey slump and add a little variation. I’m hoping to spend some time tomorrow sorting, using, and freezing any remaining leftovers. My family is about turkeyed out.